Censorship in Russia has been steadily rising in the past few years, most notably with the announcement in July 2017 when the initial VPN law was signed, and later took effect the following November. Since that time, the VPN industry was waiting to see what the outcome of the legislation would be. While oppression and censorship marched steadily forward, it seems our industry finally has an answer. 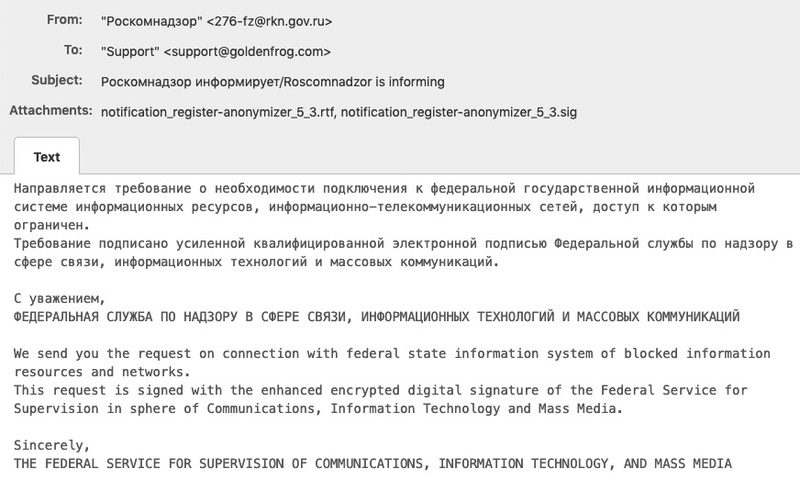 This week, Russia’s communications branch Roskomnadzor sent compliance demands to several VPN providers, including VyprVPN. You can view the email that we received below, with full translation. The strong censorship and oppression of the Russian regime was the main reason for us to avoid locating any of our servers inside of Russia. Our core mission is to keep the Internet open and free, and therefore, we will continue to provide uncensored access to the Internet in Russia and around the world. We will not cooperate with the Russian government in their efforts to censor VPN services. The VyprVPN team has been battling against the censorship created by the Great Firewall of China, and we believe that China has exported the Great Firewall technology to regimes across the world, including Russia. We are committed to providing Internet users around the world with the tools needed to access news and information without censorship. We will continue to honor our commitment to fight for a free Internet, this time in Russia.